At Super Party Wigs we stock a huge range of cheap wigs, guaranteed to make your party outfit 'pop'! For bright Coloured Wigs with a Christmas twist, visit our Christmas Wigs page where you'll also find Tinsel Wigs in 8 fantastic colours! Whether you need a Mullet Wigs, chic Black Bob wig, a Marie Antoinette wig, or a Agatha/Granny Wig , we have those too - there's something for everyone! Our favourite party wigs for women right now are the Corpse Bride Wig , Cruella Deville Wig and of course, the wickedly impish Green Wig - perfect for standing out in a crowd. 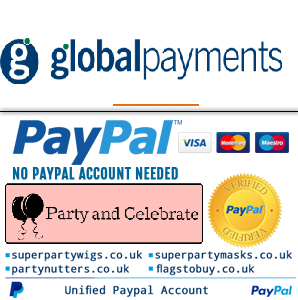 Superpartywigs.co.uk stocks the largest range of cheap party wigs online and hold a wide range of Afro Wigs Retro '70's look, Rasta wigs, Dreadlock wigs and Hippy wigs for a more laid-back theme, and Pink Wigs,Blue Wigs, and Green Wigs to make sure you get noticed!